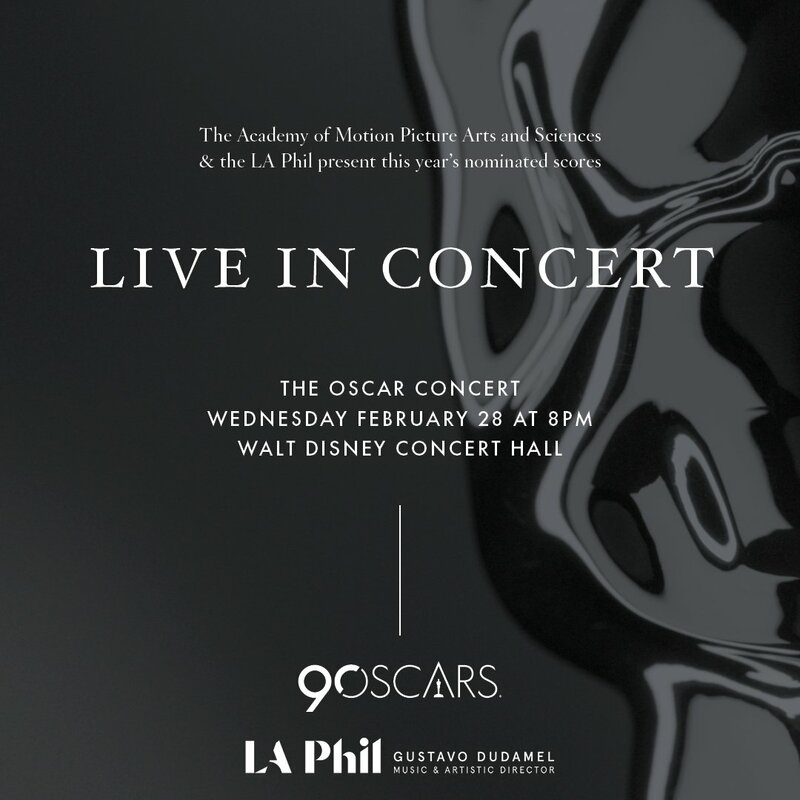 The Academy has an epic night of music planned for Feb. 28 at Walt Disney Concert Hall in Los Angeles. The Academy has an epic night of music planned for Feb. 28. Artwork for the special event. In partnership with The Los Angeles Philharmonic, The Academy is planning a special celebration of film music. Called “The Oscar Concert,” the one-night-only event will be held at Walt Disney Concert Hall in Los Angeles on Feb. 28, 2018. 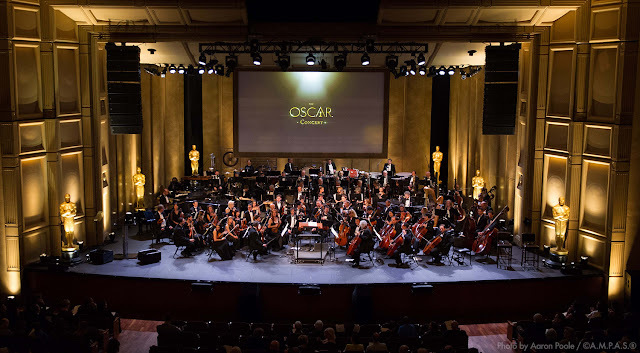 The Academy first hosted a special Oscar Concert in 2014, for which The Gold Knight was in attendance (see photo above). Hearing film scores played live by a symphony orchestra is an unforgettable experience. We highly recommend trying to make this event. The music selection, featuring memorable scores from almost a century of films, will be curated by composers and Academy Governors Michael Giacchino (Original Score Oscar winner for "Up"), Laura Karpman and Charles Bernstein (composer for "A Nightmare on Elm Street"). Giacchino and Oscar-winning director Pete Docter will open the show, discussing the art and challenges of film scoring and using clips and music from Pixar's Oscar-winning animated film "Up." The Philharmonic will also perform new arrangements of all five nominated scores: "Dunkirk," by Hans Zimmer; "Phantom Thread," by Jonny Greenwood; "The Shape of Water," by Alexandre Desplat; "Star Wars: The Last Jedi," by John Williams; and "Three Billboards Outside Ebbing," Missouri, by Carter Burwell. 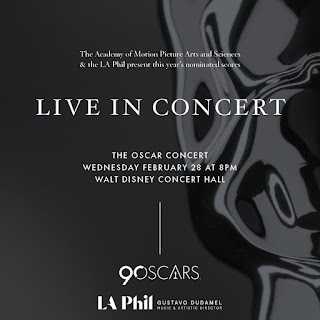 Tickets, ranging from $43 to $161, are available for purchase at LAPhil.com, in person at the Walt Disney Concert Hall Box Office, or by phone at 323.850.2000, although tickets do not appear available yet on the website. Musical selections from the Oscar-winning film "Up"
A. R. Rahman, "Slumdog Millionaire"
Jerry Goldsmith, "The Great Train Robbery"
Quincy Jones, "In Cold Blood"
John Williams, "The Witches of Eastwick"
Erich Wolfgang Korngold, "The Adventures of Robin Hood"
Tan Dun, "Crouching Tiger, Hidden Dragon"